As reported by Neal Ungerleider at True/Slant, rumours are spreading across the Arab-speaking internet that Egyption Prisdent Hosni Mubarak has died after surgery in Germany.The talk of the Egyptian blogosphere right now is a fast-spreading rumour that President Hosni Mubarak has died. Hundreds of Egyptian and Arabic-speaking Twitter users are posting news of the 81-year-old leader’s death. The reports occurred after reports of Mubarak dying in a German hospital were broadcast on Russian television and on Arabic television. 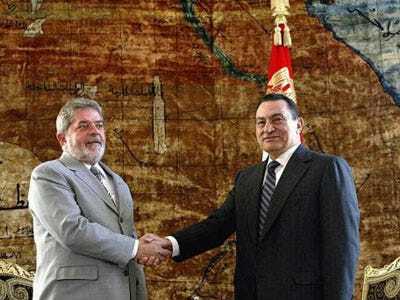 Hosni Mubarak has been the President of Egypt since 1981, making him the country’s longest-serving leader since Mohammed Ali. Ungerleider goes onto lay out what is known and what is speculation, and notes some odd moves on the part of the Egyption government, including the banning of Skype. Chalk this up as MAJOR UNCONFIRMED rumour. But we thought you should know that it’s out there. For what it’s worth, the same rumours bubbled up in 2004. Mubarak’s death would start a fight for power in Egypt, with Mubarak’s family in line to win due to the loyalty of the secret police and military. The Muslim Brotherhood, staunch opponents of Egypt’s ambiguous position on Israel would be second choice. Their sizable membership, along with renewed anti-Israel sentiment due to the 1500 new settlements Netanyahu approved, could increase populist sentiment around the party. At best they will be appeased, at worst they’ll be jailed and beaten. An outside option is the pro-liberalization group which would like to see the state’s more than 50 per cent grip on the economy abate. United States middle east envoy Richard Holbrooke will have a more difficult visit to Israel this week than previously imagined if this rumour proves true.